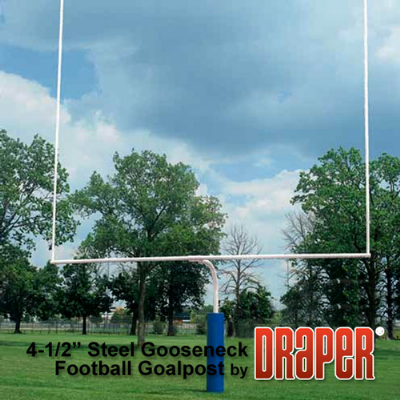 Permanent/semi-permanent installation 4-1/2" (114mm) steel gooseneck goalpost. Goalpost is white or yellow powder coated high school version with 23' 4" (711cm) between 20’ (610cm) uprights and 60" (152cm) setback for player safety. Install by direct bury permanent installation with 48" (123 cm) in ground, or semi-permanent installation utilizing optional 505100 ground sleeve. Features 4-1/2" (114mm) OD steel cross tube and 20" (51cm) high 2-3/8" (60mm) diameter uprights.